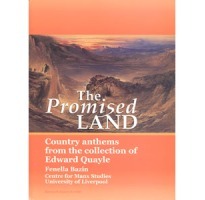 The Promised Land: Thirty-two country anthems from the collection of Edward Quayle Introduction and notes by Fenella Bazin The collection was made by a retired farmer who was passionate about music. It includes favourites like `The Prodigal Son' and `Vital Spark' as well as some ambitious anthems such as `Salem'. An extended 15 page introduction gives the background to music-making and Manx Methodism in the nineteenth century, and an appendix lists the 235 hymns that are also included in the original 276-page manuscript. CMS Research Report 8 (2000); 180pp x A4, glossy full colour cover card cover, bound specially for use as a performance copy.